Here are the articles I have written, given in chronological order. Click on a title to see the full article. I am happy to email you a copy of any item not available online if you email me at: info@finbarrbradley.ie [Fáilte roimh chomhfhreagras i nGaeilge]. Character, Co-operation and Cultural Revival, Farming and Country Life 1916: History Talks presented at Teagasc Athenry, 10 & 11 June 2016, Teagasc, Oak Park, Carlow, June 2016, pp. 220-231. Acmhainní Cultúrtha sa tSochaí Nuálaíoch, Cnuasach Comhar 1982-2012: Ailt – Aistí – Agallaimh, Leabhair COMHAR, Baile Átha Cliath, 2014, lch. 137-140. Dúchas, Dualgas & Dóchas: Spiorad na hAthbheochana in Aois na hInbhuanaitheachta, Léachtaí Cholm Cille XLIV, An Sagart, Maigh Nuad, 2014, lch. 11-21. Irish Innovation Rooted in Place, Decision Magazine, Dublin, Winter 2012, pp. 14-15. Creativity: Does Place Matter?, London Review of Education, Vol. 10, No. 2, July 2012, pp. 145-157. Future Needs the Past, Catalogue Essay for Exhibition – ‘Between Art and Industry’, National Craft Gallery, Kilkenny, May 2012, pp. 8-11. Distinctive Past Inspires Innovative Future, Heritage Outlook, An Chomhairle Oidhreachta/The Heritage Council, Winter 2011/Spring 2012, pp. 4-7. Ómós Áite i Ré an Eolais: Impleachtaí Scríbhinní Dhaithí Uí Ógáin, i Ríonach uí Ógáin, William Nolan & Éamonn Ó hÓgáin (eag. ), Sean, Nua agus Síoraíocht: Féinscríbhinn in Ómós do Dhaithí Ó hÓgáin, Coiscéim, Binn Éadair, Baile Átha Cliath 13, 2012, lch. 375-385. An Ghaeilge, an Stáit agus an Geilleagar: Ó Imeall go Lár, i Breandán MacCormaic (eag. ), Leas na Gaeilge, Leas an Stáit, Léachtaí an Fhóraim Díospóireareachta: Imleabhar 2, Coiscéim, Binn Éadair, Baile Átha Cliath 13, 2011, lch. 56-73. Youth Drama Spurs Innovative Ireland, Youth Drama Ireland, 13, 2010-2011, pp. 14-17. Regional Innovation Environments in the Knowledge Society: Identifying a Place for Irish, in John M. Kirk & Dónall P. Ó Baoill (eds. ), Language and Economic Development: Northern Ireland, the Republic of Ireland and Scotland, Belfast Studies in Language, Culture and Politics 19, Cló Ollscoil na Banríona/Queen’s University, Béal Feirste/Belfast, 2009, pp. 82-91. 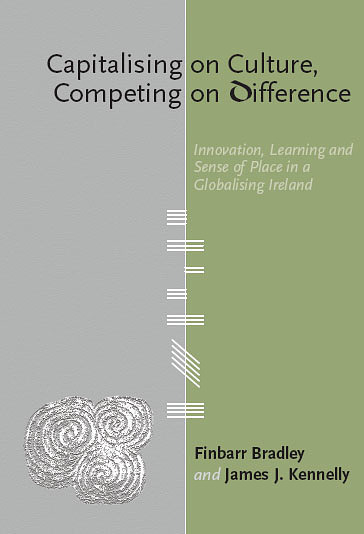 Cultural Distinctiveness as Competitive Advantage, in Joe Mulholland and Finbarr Bradley (eds. 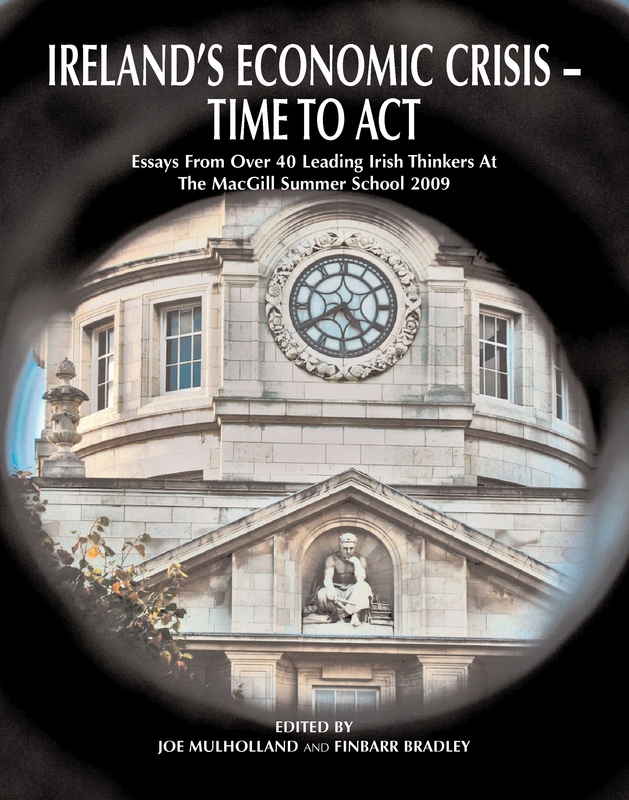 ), The Irish Economic Crisis – Time to Act: Essays from the 2009 MacGill Summer School, Carysfort Press, Dublin, 2009, pp. 316-322. 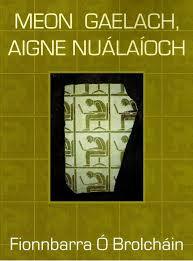 Fiúntas na Gaeilge sa Ré Nualaíoch: Ról Radacach don Chonradh, Feasta, Corcaigh, Méan Fómhair 2009, lch. 9-15. Beocht Pobal Aontaithe, Timire an Chroí Naofa, Báile Átha Cliath, Samhradh 2009, lch. 16-17. Distinctive Ireland lies at the Core of Smart Economy, Decision Magazine, Dublin, April 2009, pp. 18-19. Fiúntas an Dúchais sa Saol Nuálaíoch, Timire an Chroí Naofa, Báile Átha Cliath, Earrach 2009, lch. 22-23. (written with James J. Kennelly) Knowledge is Global, Innovation Local!, Banking Ireland, Dublin, Spring 2009, pp. 2-4. Lessons on Innovation from the GAA, Special GAA 125th Anniversary Commemorative Match Programme (Dublin vs. Tyrone), GAA, Dublin, 30 January 2009, p. 101. Acmhainní Cultúrtha sa tSochaí Nuálaíoch, Comhar, Baile Átha Cliath, Nollaig 2008, lch. 18-19. Defining Innovation in the Engaged University, in Lorraine McIlrath, et. al. (eds. ), Mapping Civic Engagement within Higher Education in Ireland, AISHE, Dublin, 2007, pp. 48-55. Innovation and Rural Knowledge Communities: Learning from the Irish Revival, The Irish Review, Dublin, 36, 2007, pp. 111-119. Discovery and Innovation in the Undergraduate Learning Experience, Irish Educational Studies, Dublin, 26(3), 2007, pp. 301- 313. (written with Frank Allen) Transporting Individuals – Transforming Communities, Studies, Dublin, 96(382), Summer 2007, pp. 145-153. (written with Gerry Boyle) The Undergraduate as an Engaged Explorer, in Thomas A.F. Kelly (ed. ), What Price the University? : Perspectives on the Meaning and Value of Higher Education, Special Issue of the Maynooth Philosophical Papers, Faculty of Philosophy, NUI Maynooth, September 2006, pp. 5-24. (co-written with James J. Kennelly) Ireland in the New Century: An Opportunity to Foster an Ethic of Sustainable Enterprise, Sustainable Development, John Wiley & Sons, 13, 2005, pp. 91-101. (written with James J. Kennelly) Ireland’s New Century: The Opportunity for an Alternative Vision of Development, Radharc [A Journal of Irish Studies], Glucksman Ireland House, NYU, 4, 2003, pp. 99-113. Redefining Enterprise Education, in Konstantin Theile & Cíarán Ó hÓgartaigh (eds. ), International New Enterprise Developments, ESB/IPBS Series, Aachen: Shaker Verlag, 2002, pp. 67-76. (written with Frank Allen) The Potential of Public-Voluntary Partnerships for the Delivery of Quality Social Services, Studies, Dublin, Winter 2002, 91(364), pp. 371-380. (written with Frank Allen) The Not-So-Simple Matter of Debt Relief, Céide: A Review from the Margins, Ballina, Co. Mayo, June/July, 2001, pp. 17-19. (written with Frank Allen) Value for Money in Public Private Partnerships (PPPs): Myth & Reality, Administration-Journal of the Institute of Public Administration, Dublin, Spring 2001, 49(1), pp. 46-58. Time to consider other approaches to financial services education, Finance, January 2001, 15(1). Time for new approaches to Financial Services Education, SIAI Society News, Dublin, 1(2), September 2000, p. 2. (written with Frank Allen) Investment Decision-Making and Heritage Management, in Neil Buttimer, Colin Rynne & Helen Guerin (eds. ), The Heritage of Ireland, Collins Press, Cork, 2000, pp. 631-637. TNG agus An Fhostaíocht-Machnamh níos leithne de dhíth, Comhar, Baile Átha Cliath, Aibreán 1995, pp. 16-19. Cúrsa Riomhaireachta agus Airgeadais trí Ghaeilge in Ollscoil Chathair Bhaile Átha Cliath, An Chéad Seimineár um Fhorbairt na Gaeilge sna Coláistí Teicniúla Réigiúnacha, Coláiste Teicniúl Réigiúnach, Sligeach, 19ú/20ú Bealtaine, 1994, lch. 24-26. How to Hedge Currency Risk, Finance, Dublin, September 1993, 7(9), pp. 14-20.
International Transfer Pricing, Chapter 35 in Frederick D.S. Choi (ed. ), The Handbook of International Accounting, John Wiley, New York, August 1991 (1993, 1994 and 1995 Supplements), pp. 29.1-29.29. U.S. Multinationals in Ireland: Perspectives on Risk in the IRS Transfer Pricing Proposals, The Irish Banking Review, Dublin, Spring 1991, pp. 31-43. Neglected Factors in the Market Pricing of Eurodollar Bonds, Journal of Portfolio Management, New York, Winter 1991, pp. 62-73. (written with Ernst & Young team) International Transfer Pricing, Monograph, Business International, New York, April 1991. IRS Section 482: Foreign Exchange Risks in Transfer Pricing, Business International Money Report, New York, 9 April 1990, p. 135 & p. 138. Corporate Risk: A Missing Link in the Transfer Pricing Debate, Business International Money Report, New York, 22 January 1990, pp. 26-27. An Analysis of Call Strategy in the Eurodollar Bond Market, Journal of International Financial Management and Accounting, New York, Spring 1990, 2 (1), pp. 23-46. (written with Jim Fitzpatrick) Science, Technology and International Competitiveness: The Irish Case, Occasional Paper Series, No. 82/1, NBST, Dublin, May 1982. Technology Licensing and Industrial Development: The Irish Perspective, Occasional Paper Series, No. 82/3, NBST, Dublin, April 1982.